Upstream in Colorado, irrigation diversions from the Rio Grande and its tributary, the Rio Conejos, began a few days ago. This resulted in the water dropping to a fishable level, down here in New Mexico. Plenty of bugs were already on the water, but in my first attempts at fishing this Spring, I came up empty-handed. I saw no fish rising to the abundant caddis flies, nor did the fish show any interest in my nymphs, Woolly Buggers or crawfish imitation. I returned to Orilla Verde yesterday, with (in addition to my tackle) my superzoom camera. I thought I might get a shot of the Western bluebirds that were showing up, and whatever else; four days ago I saw three Bighorn rams across the river from the gaging station. The caddis were out again as I drove slowly upstream, looking for rising fish. Just past Petaca CG, I saw a group of Bighorn ewes and young across the river. As I continued upstream, I came abreast the big gravel bar that spans the river, just downstream of the Mile 4 sign. And then – you guessed it – I saw fish rising! The air was full of caddis, with plenty on the surface. The fish were coming up in the tail-out to the long run that precedes the gravel bar, in water calf-to-knee deep. I put on a #16 Adams, with the hackle clipped-off on the underside, and began to catch fish. The trout were not picky, and all about 8″ long. Whereas the day before, I might have sworn that there were no fish in the river at all, this occasion of rising fish made evident (as always) that the river is full of brown trout! 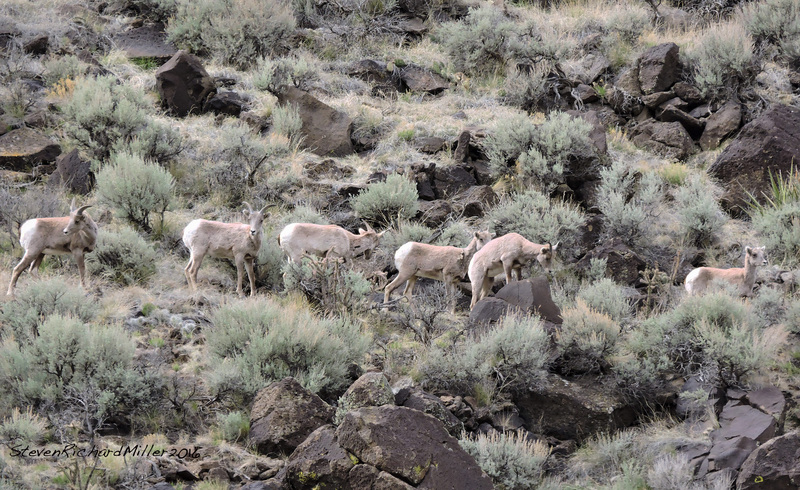 Then another group of Bighorn ewes and young descended the opposite slope, to drink from the river. After a while, they were joined by the first group that I had seen, which had worked its way up the river. It’s quite likely that sheep population density in the Box has increased to the point that groups of sheep are being obliged to move downstream, to find new range. Many folks, out on Sunday outings, stopped and watched the sheep, which, of course, are very tolerant of humans. If these sheep are here to stay, they will make a great addition to Orilla Verde. This entry was posted in Birding, Fishing, Photography and tagged bighorn sheep, brown trout, irrigation diversion, Orilla Verde Rec. Area, rio conejos colorado, Rio Grande del Norte National Monument, western bluebird. Bookmark the permalink.